I am not going to rate them from best to worst, because they are all so great! I will simply give some information about each book, and why I value them. I hope you enjoy some of these, and that you will suggest some other great books in the comments; I'd love to find some more awesome reads! This is a wonderful read! It is set in South Africa, in the Thula Thula game reserve. It centers around a herd of wild African elephants who are very disturbed and violent towards humans, because of past cruel treatment. It reads more like a fiction book than most non-fiction - meaning less facts and more vibrant imagery. It is a story! As well as rooting for Anthony as he battles to win the trust of the elephant herd, you will be intrigued by his inclusion of all things African - this book is not entirely about animals. Animals, people, and culture are all in this book, and it is wonderful to see and understand them more when they are side by side. The people and the animals share a story that is both beautiful and terrible. "The Elephant Wishperer" is very varied in content, but true to the title. It is ultimately a love story of a man fighting to heal some elephants. I had a hard time putting it down! This is written by a zookeeper who really knows her stuff! It is an honest, interesting, heartbreaking account of the bears she had worked with throughout her career. You get a look at zoo's dark side, as well as their light side. Like with so many non-fiction books, you need to be a real nerd to stay interested - I loved it! But this book is not for everyone; "The Elephant Whisperer" is a book my dad could read without getting bored. This book goes more into the science (and he would definitely get bored with that). That said, science is probably interesting to you if you are reading this in the first place - if animal behavior interests you, this book is great! Plus Poulsen's account, unlike many others, focuses on emotions and intelligence of bears, which is not nitty gritty in my opinion and rather enjoyable! If you want to learn about bears, read "Smiling Bears." It is honest and interesting, and covers science as well as what is often ignored: emotions. This is a great book of photography! From landscapes, to plants, to animals, it has beautiful images. These images are sorted into four sections; Awe, Grace, Joy, Peace. It has great representations of them all! As well as photographs, "Sublime Nature" has quotes about nature in it as well. That is what really sets it apart in my mind, and makes me enjoy looking at it so much. This story is truly charming. Two young men go to London and buy a pet lion, which made me not like them at first. But now I appreciate their honesty - even though it is definitely inadvisable to buy exotic pets. Unlike most exotic pet owners, these men did the best they could to love their pet. They share the joy of having a pet lion, as well as the pain when they see that they can't give him what he needs most. They work with George Adamson to give Christian a better life, which is both wonderful and sad to read about. 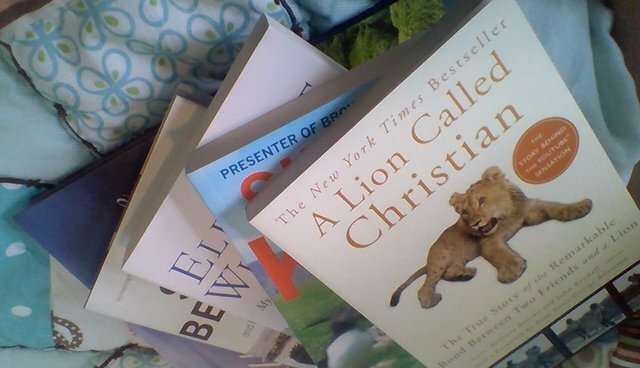 Everyone should read "A Lion Called Christian" because there is a lot to learn from it. Exotic pets are a very big issue today, and it is great to hear about it from the perspective of two young men caught in the middle of it. You also learn about his cute daughter, Savannah, who is very charming and adds a bit of humor to the book. His writing makes you feel as if you've just had a nice chat with a friend, so grab a cuppa and enjoy!